XUB Admissions 2018 - Xavier University Bhubneshwar will be conducted on the basis of the XAT, CAT, and GMAT Entrance Exams in its various Master's Courses listed below. The University will also conduct its own entrance exam, called as X-GMT (Xavier General Management Aptitude Test). Candidates will be shortlisted on the basis of their performance in these entrance exams, after that they will be called for the Writing Ability Test and Personal Interview. NMAT scores are also applicable for MBA-HRM, MBA-RM, MBA-SM, MBA-UMG and MBF programs. For MBA-UMG, GATE/CEED scores will also be accepted. The last date to fill the application form is 15 December 2017. All the selected candidates will get the different campuses of Xavier University based on their performance. 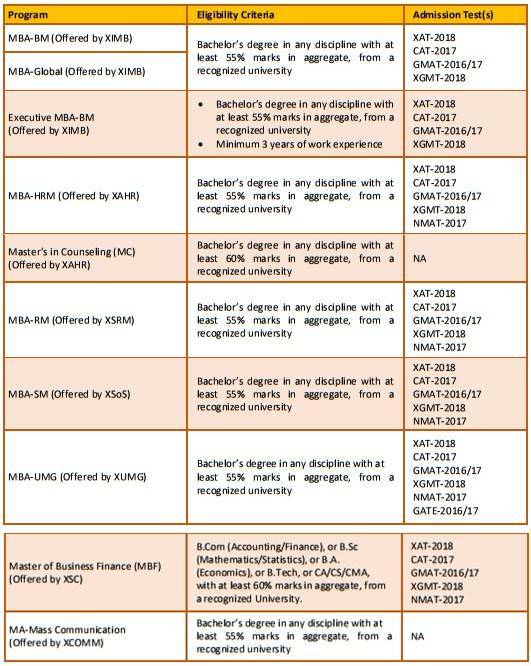 Latest Update - Application deadline for all the MBA programs listed below is extended to 15 December 2017. MC: Two-Year Master’s Program in Counseling. Candidates should check the schedule to appear for the exam, and note that the application process has been started. The eligibility criteria for XUB Admissions 2018 are given below. Candidates can check the eligibility criteria from its official site. After going through the eligibility criteria, then only candidates should proceed to fill the application form. Candidates should have a minimum three-year Bachelor's degree in any discipline with at least 55% marks in aggregate from a recognized University. Final year degree students can also apply and candidates who expect to complete their final examinations and other requirements for obtaining the degree by June 15, 2018, can also apply. NMAT scores are also applicable for MBA-HRM, MBA-RM, MBA-SM, MBA-UMG and MBF programs. The eligibility criteria for XUMG will be different for XUMG (Xavier Centre for Urban Management & Governance). So, candidates should check the eligibility criteria for it before applying.GATE Exam is taken in 2016 or 2017or 2018 AND/OR CEED taken in 2017 or 2018 will also be taken into consideration. Candidates who have secured the 1st, 2nd or 3rd position in their Bachelor’s degree program from a recognized institute, college or university can apply. Final-year degree students who expect such positions in their final examinations can also apply. These candidates do not require Admission Test scores mentioned below. All such applicants must submit a Certificate from the Head of the Institution stating their position when asked for. Candidates with a three-year Bachelor's degree or equivalent in any discipline with at least 55% marks in aggregate from a recognized University can apply with a valid Admission Test score as given below. Candidates having Bachelor’s Degree in Architecture, Planning, Geography (Hons.) and Economics (Hons.) with minimum 55% marks in aggregate are eligible to apply. These candidates need to fill the form from the official site. Candidates who have interest in the urban sector and also got some experience there and with minimum 60% marks in aggregate in their Bachelor's degree or equivalent program are also encouraged to apply. Final year degree students for all criteria mentioned in this section, who expect to complete their final examinations and other requirements for obtaining the degree by June 15, 2018, can also apply. The application procedure for admission into Xavier University MBA Program is to be completed in online mode only. There is no offline procedure for the submission of the application form. XUB Application Form is common for all the programmes. 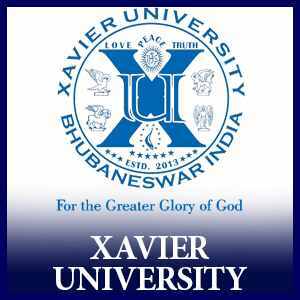 Candidates can follow the link given below to apply for the XUB (Xavier University Bhubneshwar) Admission 2018. STEP 1 – First of all candidates need to fill up their login details having an email id and contact number. After filling that they will receive an email having their unique XUB ID and Password for applying to XUB Application form. STEP 2 – After receiving their login id and password, candidates need to log in with that XUB ID and Password. Now they need to fill up their personal details like name, gender etc, Academic Details, Professional Details. STEP 3 – After giving all the details, candidates need to upload their photo & signature and choose the programs they want to apply for and the respective test options and then click on submit. STEP 4 – After filling all the details, candidates need to pay the application fee through the Payment Gateway. STEP 5 – After completing the application process and making the application fee successfully, candidates will receive the confirmation by email regarding the acceptance of online application form. Candidates should keep the scanned images of photo and signature ready in JPEG format, in advance. The application fee will be submitted in online mode only and the form will also be submitted in online mode. There is no offline process for submitting the fee and application form. Candidates should keep the photocopy of the confirmation page safe with them, till the application process is over. The confirmation mail will be sent to the candidate on their registered email. The candidates need to fill the single application form for applying into multiple programs and pay the application fee only for that single form. Here we are giving the annual fee structure of the two year MBA Program. After the declaration of the result of the qualifying exams mentioned above and the closing of the registration process, candidates will be shortlisted on the basis of their performance. All the shortlisted candidates will be called for Writing Ability Test and Personal Interview at different campuses of Xavier University. The final selection will be based on the candidate's performance in the Admission Tests, Writing Ability Test, & Personal Interview. Their past academic record will also play a significant role in their selection process. The list of the shortlisted candidates for the writing test and interview round will be released on the official site candidates can check it from there. And the final list will also be there along with that mail and letters will be sent to the final selected candidates. There is a Career Advisory Services cell, which facilitates for the campus recruitment of all students enrolled in the Xavier University Bhubneshwar. The placement week is normally around the first week of January Every Year when various companies are invited to recruit the students. This year the highest package was Rs 21 Lacs in MBA BM Course. Check the package details of various courses below.